Data Protection in the Cloud – Whose Problem Is It Really? Using cloud computing is like climbing a mountain – the higher you go the harder it is to climb. Moving mundane tasks to the cloud is easy, but for security centric applications the move is harder to make and for those involving regulated data the day may never come. That’s a shame because it’s in just these areas where the strongest economic incentives for moving to the cloud lie. The question is, who is best placed to establish the appropriate security in order to make this particular mountain easier to climb? Should cloud users plan on a “Bring Your Own Security” approach where they assume that the cloud is essentially an untrusted environment where they must wrap their own security around their applications and data, or should cloud providers be responsible for providing appropriate protection as part of a trusted cloud platform where users can feel safe and do what they do best – build applications? 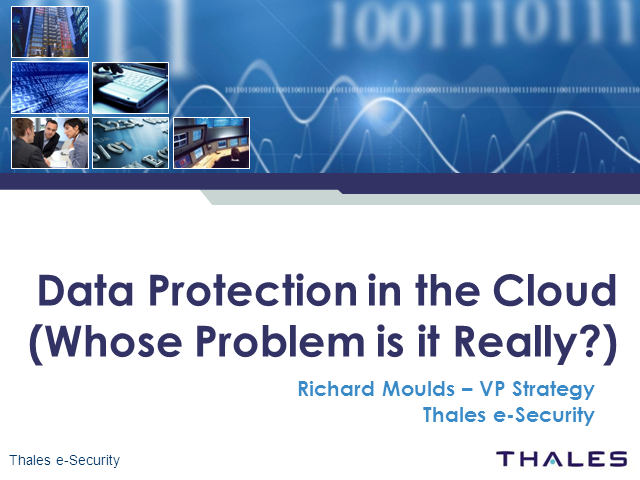 This presentation will address the tradeoffs as well as provide practical guidance regarding data protection approaches in a cloud environment. Title: Data Protection in the Cloud – Whose Problem Is It Really?